In addition to its use as a research and reference tool for a wide variety of academic fields, the DRH can also serve as a teaching platform to help students understand the complexity of religious experience throughout history and the complexity of academic knowledge production. This document outlines a variety of approaches to the Database of Religious History (DRH) as a pedagogical tool for use in undergraduate and graduate teaching. Approaches outlined here will be roughly divided into two levels of pedagogical application, activities and approaches relevant for the undergraduate classroom experience and those more appropriate for graduate-student research and training. In the undergraduate classroom experience the focus is on probing students to think and share on topics covered by the various polls. The DRH provides ready-made broad questions about religious experience with substantial data to serve as background reading. For graduate students the DRH can become a platform for research and writing. By using the questionnaires as a model, graduate-students can be guided in the creation of entries that serve to structure their own research as well as provide them an early publication. When the pedagogical use of the DRH in the classroom begins to turn towards the actual creation of usable data for the DRH it is worth considering the way in which we are valuing the real research output of our students. To this end, consider resources like the UCLA “Student Collaborators’ Bill of Rights”. The majority of approaches for the DRH in undergraduate pedagogy revolve around using sections or individual questions taken from the polls as ways to stimulate thinking and research. These are focused primarily as in-class activities but might also extend to response papers and group projects. The DRH provides a way to cross disciplinary boundaries and help the students think about how knowledge is reported in the humanities and sciences, for instance: can a DRH entry be thought of us a “lab report” on a religious group? Furthermore, the quantitative side of the DRH can address potential differences in learning styles within the classroom and offer students more comfortable forming conclusions from data a chance to participate in classroom discussions. The DRH has created a special entry type, the Supervised Entry, for use in undergraduate classrooms where creating and publishing entries is one of the intended learning outcomes. The class instructor, as Supervisor, serves as the first author of the entry, and is ultimately responsible for vetting the work done by the students. Students are listed a full co-authors on the entry, and when it is published on the DRH site (and issued a DOI by the UBC Library) will have an official publication to their name, which is both inherently satisfying to students and a useful addition to a CV or letter of application. Many classroom activities are possible using the DRH as both a framework and a reference tool. For instance, at the simplest level, the entries within the DRH can serve as reference tools for undergraduate students in the classroom and as readings on a syllabus. 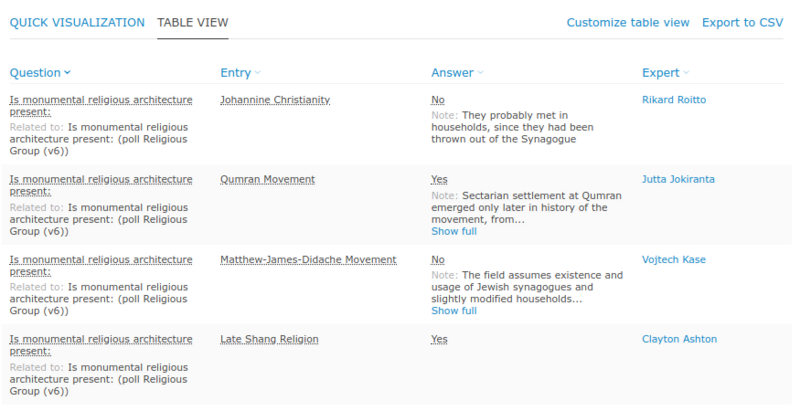 Students can be encouraged to browse through the DRH and find and compare groups to note basic differences of commonalities between traditions. This approach can also be modified to include research questions relevant to the class but not necessarily included in the questionnaires. In this case, the students can learn to find support for their answers within the entries they are browsing. 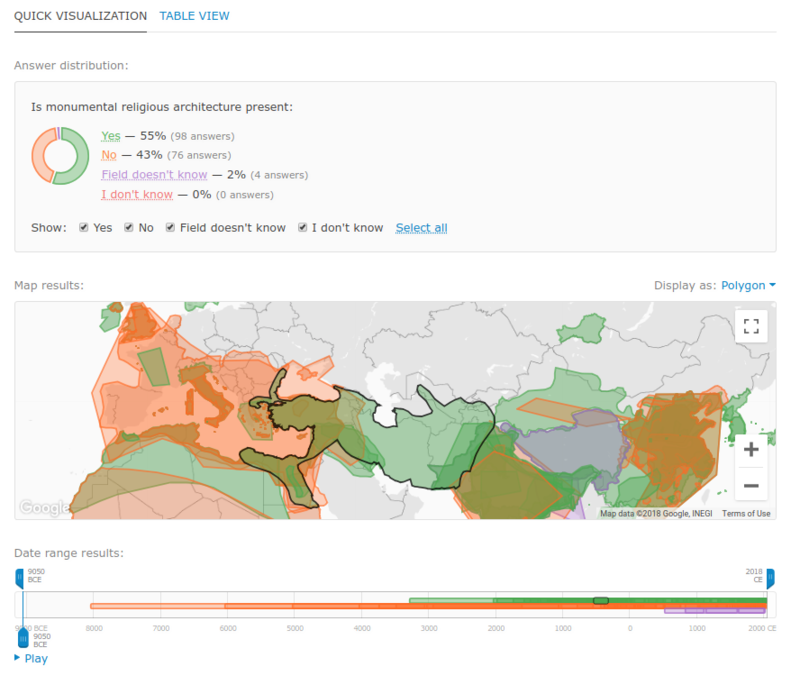 The DRH’s powerful, built-in visualization feature is also a great addition to the classroom, allowing students to see how a particular feature of religious practice or belief has spread geographically over time. The various polls in the DRH provide readymade questions that can be excerpted for use as either a classroom entry or form of assessment. This is primarily intended to be completed by single students working alone. These questions can be directed at the more quantitative (e.g., rough time-frame for a religious group) or qualitative (e.g., what is the process of assigning religious affiliation?). The diversity of data within the DRH allows for this approach to apply to a wide variety of cultural spheres depending on the class focus. Entries can be used to test students knowledge as they start the class or new segment, or conversely the entry questions can be used as a form of assessment at the completion of a body of knowledge. In group-learning situations, students can practice “Think-Pair-Share” using a similar method to the above single student model. Here students would spend time on their own thinking about the answers to questions posed out of the DRH polls. They would then pair up with partners in either pairs or small groups and discuss their answers to the questions. Finally they would return to the larger group and share their results. Students (or small groups) can also be assigned “Case Studies” from a poll and work on their answers either in class or as a project. These case studies can then be reassembled by the class in order to form a larger picture of one religious group, or to look horizontally at a particular question or topic across many religious groups. Students can also be assigned questions to prepare for an in-class debate. Students, or small groups, could take opposing sides to a question and prepare reasons and sources why they support a “yes” or “no” answer. The DRH’s search tools can be utilized to find areas of scholarly disagreement to provide for fruitful exchanging and learning opportunities. Depending on the level of graduate students many of the approaches above can still apply, but with added rigor appropriate to the nature of the course. However, graduate students can also serve as independent members of the DRH scholarly community. This relationship can be managed at several different levels. Graduate students in the early stages of their research careers can work collaboratively under a professor to produce elements of an entry that can be later combined into one unit by the supervising instructor as a “Supervised Entry.” This allows students to slowly ramp up their ability to approach a DRH question and find and analyze the sources necessary for coming down on a “yes” or “no” answer. Depending on the size and confidence in the students this type of work can be done on a class-wide or small group basis. Graduate students who are nearing their comprehensive exams or defending their dissertation prospectus are an an excellent position to write “Secondary Source” entries. As part of their training they have compiled and digested a wide range of secondary sources relevant to their topic. Creating and filling out a DRH poll on the chosen topic is an excellent way to re-synthesize all of that knowledge into a new form, strengthening their own expertise, but also contributing valuably to the DRH. They can also prepare “Expert Source” entries based on, for instance, their supervisor’s published works, which are then edited and revised by the expert before publication. Finally, graduate students who are in the final stages of writing up have the expertise to serve as academic experts for the DRH and contribute valuable entries on their own right. This is an ideal way for a young scholar to establish and publicize their particular expertise, and also begin to interact with the scholarly community in the form of providing comments on other existing DRH entries. For all three of these types of involvement graduate students can be credited with some form of authorship in the DRH. The degree to which they are assigned authorship increases as their own expertise becomes the basis for the data within the entry. They may also become eligible for an honorarium from the DRH upon the completion and publishing of their entry, or earn an hourly wage as an RA if producing an Expert Source entry. The publication of an entry with the DRH can serve to jump-start a junior scholar’s CV with a digital-humanities publication archived by the UBC library and provided with a DOI.